I love brownies. The homemade kind with a moderate layer of rich chocolate frosting smeared on top. A friend of mine makes an amazing chocolate/peanut butter frosted brownie that seriously makes you weak in the knees. Oh. My. Word. They are so good that thoughts of eating half the pan myself seem entirely reasonable. Part of me believes that delving in and indulging with gusto is actually a sensible idea. That part of me knows how much I would enjoy every bite. However, another part of me remembers that I want to be healthy, fit, and full of energy. Eating half the brownies will not contribute to health and fitness no matter how you slice it, and feeling as though I just ate the Titanic would be awful. 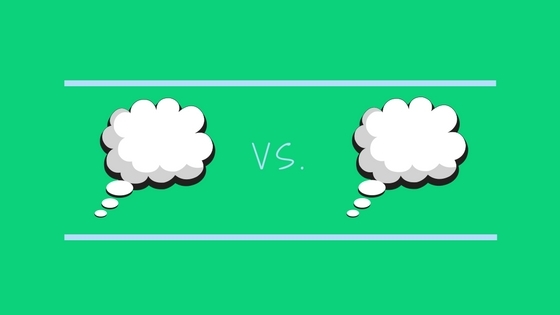 There you have it – the showdown of competing thoughts. This is a pretty silly, if not all so real, example of how we often hold two conflicting thoughts at the same time. This experience is also known as cognitive dissonance or holding opposing ideas. Simply said, competing thoughts are inconsistent with one another or with the values, priorities, and goals we espouse. We easily manage all kinds of opposing thoughts everyday without significant struggle. That said, the tangible effects of competing thoughts can range on a spectrum from zero impact to deep internal distress depending on the importance of the issue at hand. Sometimes our cognitive dissonance manifests negative results that leave us reeling. Human beings are naturally built for equilibrium. The inner conflict that results from opposing thoughts of significant personal magnitude alert your mind and body to send ‘energy’ to the conflict until it is resolved one way or another. In the meantime you will likely feel uncomfortable and ill at ease. The unmanaged conflict and related discomfort often show up externally via negative or undesirable behaviors, poor decision-making, and/or strained relationship with others. You have to have awareness that a problem exists before you can change it. An easy way to develop awareness of competing thoughts is to pay attention to your emotions and to what is happening in your body. The discomfort of conflicting thoughts can lead to angst such as anxiety, stress, frustration, or irritability. Physically you might feel tense, confused, unfocused, or otherwise out of sorts. Long term or persisting inner conflict can result in symptoms of depression and anxiety, and behavioral shifts in motivation, performance, productivity, and the ability to relate well with others. Everything is connected, so if you pay attention to what is happening externally you will find clues directing you to look inward. Once you acknowledge the outer angst, its time to delve in to discovering the inner conflict. You will want to identify what the situation is now, and really pinpoint the specific issue that brings about distress. Then start digging and ask yourself questions about your thoughts related to the issue at hand. I’d recommend doing this exercise in a deliberate way. Set aside time to reflect and to put your ideas down on paper. Writing it down not only helps to reveal your competing thoughts, but it also has the added bonus of off-loading the negative energy that has been weighing you down. Significant relief comes from acknowledging what you really think or what you really want to say – even if it is to yourself on paper. 4) Create a new thought that minimizes the importance of both thoughts, thereby eliminating the conflict (ex: “I don’t care”). Competing thoughts, especially about matters that are integral to who you are at your core and what you really want, can be emotionally and physically burdensome. Stay attuned to your external queues and explore your below the surface thoughts as often as needed. Then be intentional about choosing a course of action. This consciousness skill is one of the fastest ways to return to the equilibrium and well-being that you seek.